The City of Calgary for the longest time did not like Pride Parades. 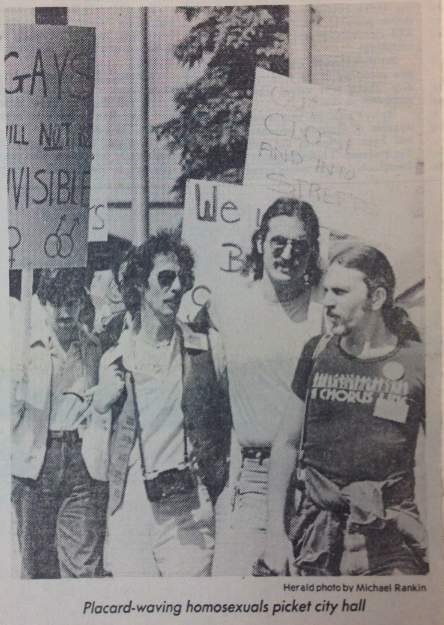 One of the earliest confrontations between City Hall and the gay community happened in 1980. Gay Information & Resources Calgary (GIRC) was hosting a national gay rights conference at the University of Calgary. These conferences in the 70s and 80s moved around the country as the gay rights movement gathered a critical collective mass. Calgary’s conference was the 8th annual event: at each conference, the organizers would stage a human rights parade. However, City of Calgary Police Chief, Brian Sawyer, refused the permit for the parade citing that “confrontation was a possibility.” Organizers decided to march anyway. Protests, rallies and marches were springing up all over North America in this period and became an important platform for the gay rights movement, creating visibility for a relatively unknown community. GIRC was located in the Old Y Centre for Community Organizations; Calgary Outlink today is a direct descendent of that 70’s incorporated non-profit society. This entry was posted in Gay history and tagged Alberta Federation of Labor, Bob Harris, Calgary, Calgary Outlink, Calgary Police, City of Calgary, gay, Gay history, Gay Information & Resources Calgary, GIRC, history, human-rights, lesbian, Old Y, queer, University of Calgary. Bookmark the permalink.